TORONTO, March 20, 2019 – After signalling its hopes for fiscal responsibility, corporate competitiveness and tax reform, the Canadian accounting profession is expressing its disappointment over the Liberal budget tabled yesterday by Finance Minister Bill Morneau in the House of Commons. 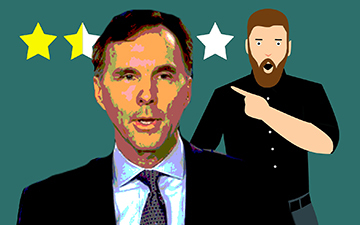 Morneau provided no timeline for a balanced budget and projected a 2019-20 deficit of $19.8 billion. "Canada needs a plan for fiscal stability, one that establishes a target date for a return to balanced budgets over the medium term," said Joy Thomas, president and CEO, Chartered Professional Accountants of Canada. "The government must demonstrate that it has a plan to eventually rein in spending and address persistent deficits, especially with the economic uncertainty facing the global economy today. This would greatly assist in creating business confidence and minimizing the burden on future generations." Deloitte Canada had called for measures to improve business competitiveness and productivity, “while still supporting the objectives of a balanced budget over time and a gradual reduction in the level of debt to GDP.” But Craig Alexander, chief economist of Deloitte Canada, told the Globe and Mail today that the current deficits are not large. “I’m not keen on running deficits when you’re 10 years into an economic cycle, but Canadians aren’t concerned and the deficits allowed the government to invest in the priorities they have before the next election," said Alexander, who would prefer a balanced budget as preparation for the next recession. PwC Canada had called for the same overhaul. “A comprehensive review of Canada’s tax system is long overdue,” said Dean Landry, national tax leader for PwC Canada, earlier this year in a pre-budget review. The pre-election budget was largely seen as focusing on the concerns of middle class Canadians and demographic interests rather than corporate Canada. (The fall economic update provided $14 billion in tax relief for Canadian business investment.) Chief among these were changes to the Home Buyers’ Plan, tax credits and investments in training and youth job creation, infrastructure funding, indigenous social service funding, and first steps towards a national pharmacare program. There was plenty, however, for Canadian accountants to chew over. These included changes to the Scientific Research and Experimental Development (SR&ED) tax incentive program; small businesstax deduction expansion for farmers and fishers; more funding for the Canada Revenue Agency and its aging information technology systems; changes to CRA service delivery; new rules on transfer pricing and the fight against money laundering. No doubt these will dissected in the days ahead by the profession as the public practice sector answers the inquiries of its clients. Colin Ellis is the managing editor of Canadian Accountant. Image from Canadian Accountant from image by Mohamed Hassan from Pixabay.